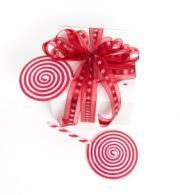 Are you looking for gourmet lollipops? Lollipops are an old-school treat that's still popular today, but exactly what makes them gourmet and where can you find them? Depending on who you ask, you might get a different definition of what makes a gourmet lollipop. Usually, you will get one of two answers. Some people believe that what makes a lollipop gourmet is the way it looks. They think that big, colorful, gorgeous suckers like the popular swirler are considered gourmet creations because they are impressively beautiful. Others, come in different shapes and intricate designs. A lot of time and effort goes into the making of these little mini works of art, and this earns them the title of "gourmet." In fact, there are still many artisan candy makers out there who work their magic to produce lollipops that stand out against the rest. Other people don't think that aesthetics should have anything to do with calling something gourmet, and instead this title should be reserved for foods that have exceptional flavor and are made with high quality ingredients. For these folks, if a lollipop is going to be called gourmet, it should have bold, original flavors, possibly something you've never thought of before (like maple bacon). They might be made with different sweeteners, or perhaps they come from an organic candy factory. Where Can You Get Special Lollipops? Lollipops can come in many styles and flavors. There are many sellers online who offer all kinds of lollipops, from colorful spiral suckers to little poppers in interesting flavors and designs. Here are a few Internet shops to check out. Lollyphile is all about making lollipops gourmet and chic. They sell a variety of "adult" flavored lollipops, such as absinthe, vanilla bourbon, maple bacon, and wasabi ginger. They even offer a monthly Candyphile membership, where you can receive a new gourmet candy delivered to your door every month. Melville Lollipops sells gourmet lollipops in all sorts of great shapes and colors. They even sell the old original barley-flavored candies that were popular in the early twentieth century. The Sugar Factory offers a selection of beautiful swirled lollipops in a range of colors and gourmet flavors such as peppermint, bubble gum, cotton candy, and very berry. Candy Warehouse sells People Pops, a variety of gourmet lollipops that have so sugar, saccharin, artificial colors or preservatives. Made more for adults who aren't looking for super-sweet candy, these pops are a favorite of candy aficionados. They come in a huge variety of flavors, such as double chocolate, hot and spicy cinnamon, lickin' lemon, orange zip, pink grapefruit, and tangy citrus parfait. 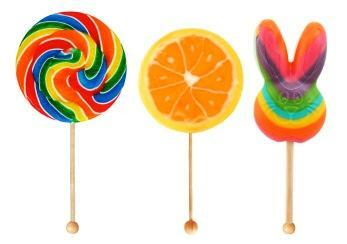 Organic lollipops are perfect if you're trying to reduce the amount of chemicals and pesticides in your life. If you're living an organic lifestyle, these will be a great treat for your kids. Here are a few more links to check out that will pique your interest in these special gourmet lollipops. When it comes to candy, the sky's the limit! Want to try your hand at making your own special lollipops? Here's a great tutorial to get you started. These little cupcake lollipops are cake inside. If you'd like to make some yourself, follow these directions.